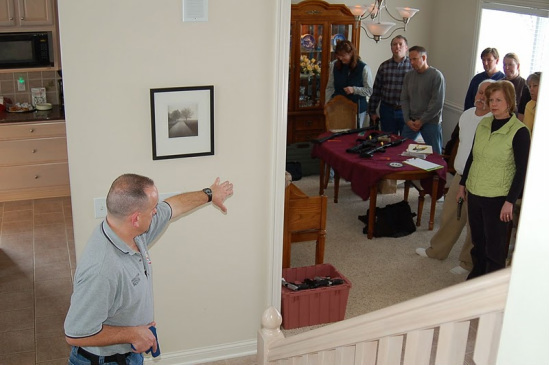 Personal Defense Systems knows that it is extremely important for people to learn how to properly setup their home and how to protect those you love. We will provide you guidelines for developing a home invasion plan as well as how to enhance your current plan. As with anything else, Home Defense begins and ends with mindset! The question is are you willing to bet your life and your family’s lives on what you THINK you know about protecting your home? Even if you learn just a couple of things that you didn’t know, it was well worth the price of the course which is a mere $100.00. When signing up for a class be sure to fill out an online Personal Defense Systems Registration Form for each person attending. We need your payment and your registration form in order to process your request. Your PayPal receipt will show "Ohio Shooting Sports". Our instructor demonstrates to the class the finer points of "slicing the pie" and using available cover during our Home Defense class.